COLOMBO, Jan 11 (Reuters) - Sri Lanka is investigating a number of foreign and local aid groups it suspects may be helping Tamil Tiger rebels, and may banish a Dutch organisation from the island, a top defence official said on Thursday. The military said this week it had found equipment belonging to Netherlands-based ZOA Refugee Care at a rebel base overrun by the military in the eastern district of Ampara. ZOA, whose projects are focused on helping refugees in Sri Lanka's restive east, said that any recovered equipment with their logo must have been stolen. Defence spokesman Keheliya Rambukwella said if found guilty, offending groups would be expelled from the country. He did not name other groups under investigation. "We found an NGO fully and totally involved in running a hospital at Stanley Base. It is ZOA," Rambukwella said by telephone. "Certain NGOs are acting against the normal law of the land and have got involved with subversives. Some have stooped down to assisting the terrorists. "Once investigations are over and we have 100 percent confirmation of what we suspect ... we will have to take steps to have their visas cancelled or have them leave," he added, referring to ZOA. ZOA's general affairs manager, Anslem Mudiatta, said: "The allegation is of course groundless. "We ... closed our office because of fighting and had to leave so many things behind we couldn't carry with us," he added. "Certain things they say were found in that LTTE (Tiger) hospital are things we presume were taken from our office." The conflict has forced many aid groups to shelve or abandon projects in conflict-affected parts of the north and east, where aid workers say both the military and the rebels are hampering access to civilians trapped in the crossfire. 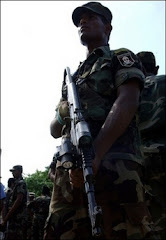 In a separate incident on Thursday, elite police commandos overran another Tiger camp in Ampara and found two boats donated by Save the Children and two tents emblazoned with the UN refugee agency UNHCR's logo, officials said. But they said it was clear that, in this case, the aid had been stolen from civilians it was donated to. Neither aid group is being investigated, the officials said. Some aid workers fear the government is mounting a witch-hunt against aid groups to appease hardline nationalists who seek to blame the international community for the ravages of the island's ethnic conflict. The European Commission on Wednesday endorsed the work of ZOA along with U.N. agencies and the Red Cross, and called for greater access to help conflict-displaced civilians. "It's totally clear that ZOA are not helping the Tigers at all," said Jeevan Thiagarajah, head of the Consortium for Humanitarian Agencies, the main umbrella body for aid agencies in the country. "I think it's a pure and simple misunderstanding." More than 67,000 civilians, troops and rebel fighters have been killed in the conflict since 1983.